Dog shows are meant to show off the best of the best examples of purebred dogs. There are many strict standards that must be adhered to, and not all of those standards result in healthy pups. One artist, Levi Morris, created a series of dog breed portraits that show off just how harmful these purebred standards can be. 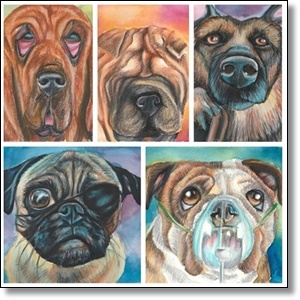 In one painting, he shows how the short snouts and flat faces of Bulldogs can lead to breathing problems. 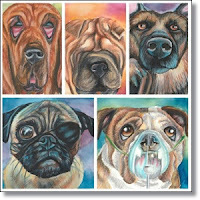 In another, he shows how large, bulging eyes on Pugs can lead to problems with vision, and even eyes falling out. And in another painting, he shows how the excessive folds of a Shar-Pei‘s skin can cause irritation.